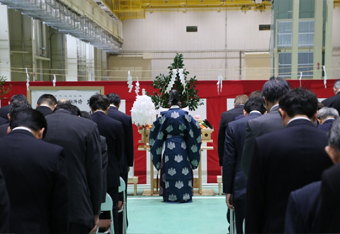 Tokyo, April 27, 2016 – Fuji Heavy Industries Ltd. (FHI) today celebrated the completion of its third assembly facility for aircraft parts on the premises of its Handa Plant located in Handa City, Aichi Prefecture, Japan. The new assembly facility has a total floor area of approximately 11,600 m2 and will be equipped with assembly lines featuring state-of-the-art automatic riveters, automatic transferring machines and painting machines. The center wing box is one of the key structures of an airplane connecting the fuselage and wings. The new assembly facility is scheduled to start operation in early 2017 to assemble center wing boxes for Boeing’s next-generation passenger jet, the Boeing777X. 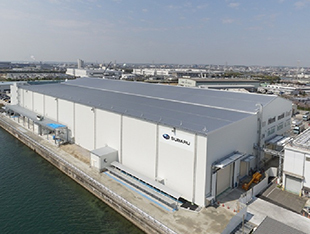 The Handa Plant performs assembly operations for center wing boxes for Boeing 777 and 787 passenger jets as well as center wing boxes for maritime patrol aircraft (P-1) and cargo transport aircraft (C-2) for Japan’s Ministry of Defense. With the completion of the new assembly facility for the Boeing 777X, the Handa Plant will become a manufacturing complex for center wing boxes that has no parallel in the world. In addition to the manufacture of aircraft, FHI has expertise in the development and manufacture of center wing boxes and wings as well as composite structures. FHI will continue to strive to further enhance its technologies and thereby consolidate its position in the global aerospace industry.